The audio problem was on 3.09 too but it seems it is still there on 3.10. When I load a session and play it the audio breaks up and I get no audio. When I reopen the session there is still no audio. It looks like the dreaded audio problem has returned. This problem only happens on some sessions. The session uses a bank with 64 pads but 20 pads are used for samples and only five of the samples are used so I don't know why the audio is breaking up and I then get no audio. Please advise. @Artmuzz have you tried readjusting your audio rate and/or latency in settings? Adjusting the audio rate and latency doesn't make any difference. The affected session contains two tracks. There is one bank on each track. The first bank has 64 pads but only 20 of the pads have samples on them and I am only playing 5 of the pads for samples. On the other track the bank has 8 instances of Dixie AU plugin playing at the same time. There are times I can open the session and I can hear audio and there are times when I open the session and a I can hear no audio or the audio breaks up and I hear no audio. I don't have this problem with my other sessions. Perhaps it's the 8 instances of Dixie? Have you tried soloing one Dixie pad? Might want to record it to another pad or audio track. Lol does the word polyphony mean anything?? @Artmuzz what is your CPU meter doing when you try to play? That is a damn shame if that is the case because I was excited to get 8 instances of Dixie AU so I could create and play Yamaha TX816 patches on BM3. I knew it would be too good to be true. My CPU meter seems to be fine when playing that session. If that is the case then I am disappointed because I was wanting to create and play Yamaha TX816 patches using 8 instances of Dixie and I was excited that I was able to but if BM3 is having panic attacks doing this then it's a pity. At any point was this project identical before you updated and did not reproduce audio issues? have you tried unloading reloading a few Dixie's to see if it fixes the issue? Are you using the Dynamics plugin? Yeah the project was identical before I updated to 3.0.10. The same problem happened on 3.0.9. The only fx plugin I am using is modulation delay on the Dixie bank. I created a new session and loaded the bank with the 8 instances of Dixie and created 4 tracks with Poison-202 AU plugin and it seems to work fine. I reopened it and the audio still plays so the issue isn't with the bank with 8 instances of Dixie which I am glad to know. I think the issue could be with the bank with 20 pads that have got samples on them. Disk streaming on/off? Mem usage? It's just very strange to me I guess. It's hard to help as well. If I owned dixie id say send the session. Just bought Dixie, cuz hey it's $4 and I'll use it in this month's battle. I put an instance on the first 8 pads in a single bank, set them to each use a different program, entered notes for each pad in one pattern, then I copied and pasted those first 8 instances into pads 7-16, copied the notes from pads 1-8 and pasted them into pads 7-16, and no hiccups at all hahaha. So it shouldn't be Dixie causing problems! That said I have a 2015 iPad Pro. What's your iPad, @Artmuzz? And do you have any AUv3 effects in the project? The other questions about the samples are still worth answering too. Also, I'm hoping you have tried rebooting your iPad and quit/restart BM3 at least once in all of this. Haha. I bought it too. Lol. Everyone should buy it - it's great! I already mentioned on here that it wasn't Dixie causing the problems. I am using an iPad Pro 9.7 and running iOS 10.3.3. I have quit/restarted BM3 and even rebooted my iPad Pro but the problem still exists on that particular session. However all the other sessions I have with the bank of 8 instances of Dixie work great and don't have the audio problem. So, I am guessing the problem is with the bank with the 20 pads of samples even though I am only using five of those samples when I play the session. KQ Dixie is the best DX7 emulation on iOS. It reads DX sysex and it can be used as a controller to edit an actual DX7 synth. @tk32 How does dixie compare to say Kauldron or something ? I remember I wrote that off and it ended up being quite versatile ? I know you asked tk32 but as you should already know I own it too and KQ Dixie is the best and most accurate DX7 emulation on iOS. It reads DX sysex and it can be used as a controller to edit an actual DX7 synth. It has all the parameters of the DX7 including the 32 algorithms and 6 operators. 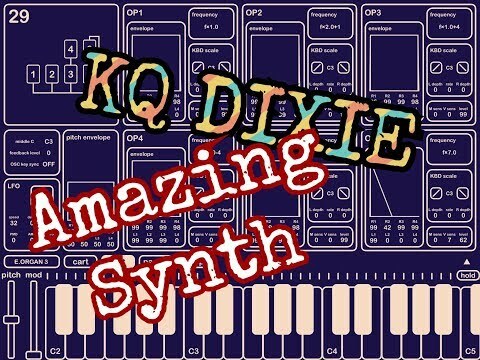 I know you asked tk32 but as you should already know I own it too and KQ Dixie is the best DX7 emulation on iOS. It reads DX sysex and it can be used as a controller to edit an actual DX7 synth. It has all the parameters of the DX7 including the 32 algorithms and 6 operators. oh cheers - sounds interesting though I confess I'm not a huge synth head, so not familiar with the dx7 - I guess that was a legendary synth of some kind? The DX7 was an iconic synth in the 1980s and one of the best selling synths at that time. It was used on film and tv soundtracks by composers ranging from John Carpenter to the BBC Radiophonic Workshop and most pop artists and bands from Howard Jones to Depeche Mode. It uses a form of synthesis called FM but the actual synthesis is more PM (Phase Modulation) than traditional FM. Anyway, I recommend Dixie. Everyone who is putting out decent AUv3s (and at ridiculously low prices) deserves our support, especially when it's barely more than the cost of a London coffee. My only word of warning with the Dixie... not many factory presets. However, the interface is a tweaker's delight... so stop whining and make your own patches... or download some of the millions of sysex DX7 patch files from t'internet. Also, it was super easy to download a mega pack of patches (dx7 all the web) in Documents (Readdle), then copy them to KQ Dixie via Files app. Dixie can load the patches even while they’re all in sub folders inside one zip file. Pretty slick! There’s got to be something going on with the samples in your project, @Artmuzz. Perhaps you might not mind sharing the full project with someone so they can take a look. I just got the Space X pack from the BM3 store and loaded everything it offers into one session. That’s 32 banks, I don’t know how many samples, and with nothing playing at all, no patterns in the session, my iPad’s cpu sits at around 65%, and I can hear some occasoinal crackles when playing pads in some banks. I believe the cpu usage and crackles are due to the multitude of effects on each bank, most of which are actively waiting for something to affect. Dixie make look ugly, but once you load it in BM3, it doesn't matter. This thing is great. Bought! I buy what i need. Ps. Buying some sound packs you might not need is a good way to support intua when they are working their asses off polishing bm3 to be the best daw/sample sequencer on ios. You know they could easily do what positive grid and retronyms have done too much in the past and basically just abandon their apps when it has made them the most $ per work hour and maybe patch when sales start to suffer enough due to people crying on internet for them to make more $$$ by investing few hours of work(= $) to it. I actually like the KQ Dixie UI - minimal clutter. Of course, I haven't done much other than load (sysex) "cartridges" from Dexed in it yet, but in that regard, it's much easier to work KQ Dixie than Dexed for browsing.